After arriving in Perth we rented a car and decided to drive along the coast all the way to Esperanza and then go inland and return via the outback. 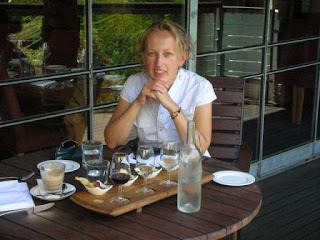 Without stopping in Perth we took off towards Busselton only stopping in Fremantle for a coffee. The first stop on the way was a little town of Bunbury with a dolphin interaction center. 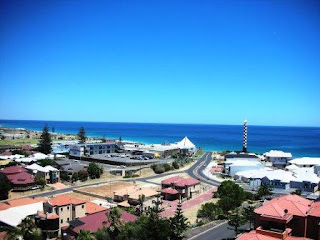 Busselton is a pretty little town 100 miles from Perth on the coast. It’s also a home to the Western Australia Ironman, which takes place in December, so it was an essential stop on our trip. 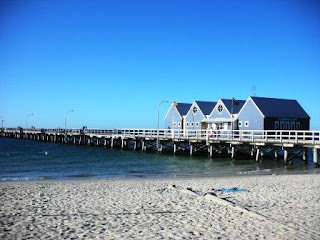 The central feature of Busselton is the 2km long jetty with an underwater observatory at the end. The Ironman course follows the jetty around, but for more details about this head over to my training blog. In the evening we went to a drive in cinema. 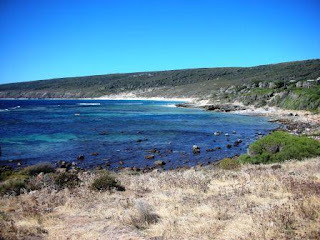 Continuing heading south along the coast we drove slowly stopping at some great little beaches along the way to our next destination – the wine region of Margaret River. 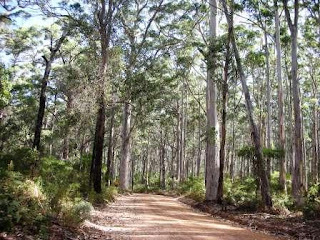 The drive from Margaret River to Albany via Augusta and Pemberton was spectacular with 600 years old Karri and Maui forests. With a stop to climb a 60 meters tall tree and a 10 km walk thought the forest. 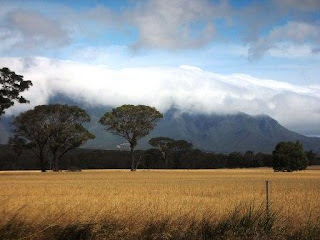 After arriving at Albany we realised that we won’t be able to go all the way to Esperanza if we want to make our flight to Darwin, so we changed the plan and took a road north towards Hayden via the Porongurup and Stirling Range National Parks. We did a nice short walk in the first park though the forest to the Rock Castle and wanted to do a longer walk in Stirling, but unfortunately the weather got worse and visibility was poor, as you can see from the picture below, so instead we just drove straight through to Hayden. 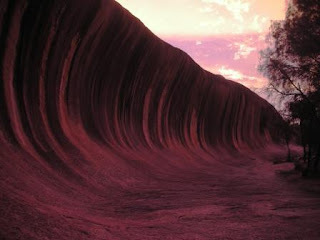 Hayden is a small town, in the middle of nowhere (in the outback country), close to the old gold mining fields and is made famous mostly by the spectacular wave rock. Best seen at sunset the rock is shaped like a perfect wave just about to break. 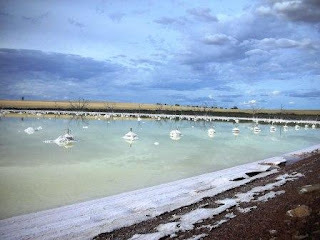 The 400km drive to Perth though the outback was made a little bit more interesting by a stop for a nice swim at Bruce Rock and seeing some of the salt lakes on the way. There were not many towns on the way and we hardly seen any cars on the road – unusal seen for someone leaving in London. 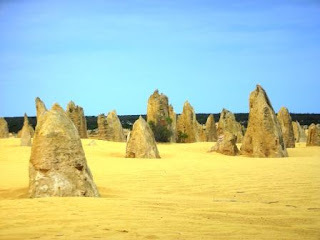 Before going to Perth we had enough time to stop overnight in the Avon Valley to drive in the morning to see the spectacular limestone rock formations of the Pinnacles Dessert. 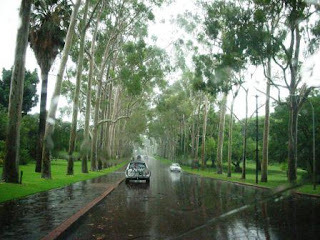 Perth unfortunately greeted us with some unusually wet weather. Even the locals who we spoke to were surprised by this weather, as it rained non-stop for 24 hours, which is unheard of this time of the year. Here is a view from the flooded Kings Park. Perth seems really pleasant and relaxed and easy going for this size (over 1.2 mln) city, but unfortunately we didn’t really have enough time to fully explore it as we have a plane to catch to Darwin in Australia’s Northern Territory.